It’s no secret that Facebook is fast becoming the go-to platform for online advertising. In 2018, Facebook alone controlled 20% share of the entire digital adverting industry. In Q1 of 2018, advertising accounted for $11.7 billion in revenue for Facebook, up from $5.2 billion in Q1 of 2016. That’s a 125% increase in only 2 years! Over the past few years, businesses have flocked to the network to generate brand awareness, engage with their audiences in new ways, and ultimately convert attention into revenue. With this increased competition and rising ad prices on Facebook, it’s become more difficult to launch successful ad campaigns and stand out amongst an increasingly savvy market of advertisers. Are there any Facebook ad hacks left that can help you outcompete other advertisers? This is a thought we have nearly every day. As a lean SaaS startup, we value every dollar in our budget. And we have to constantly evaluate every investment we make in marketing — thousands of dollars that aren’t effectively converting customers could be better spent on engineering talent or other channels to grow our business. Couple that frugality with our $65 average revenue per customer, and you can see that being cost-effective while still ramping spend on Facebook is a real and imminent challenge for our growing business. How do you profitably convert more users on Facebook as ad costs continually rise? One of the most powerful yet simple ways to captivate your audience and improve the performance of your Facebook ads is to leverage the power of social proof. Social proof is not new to marketing by any means. It’s deeply ingrained in psychology. Humans are social beings, and the feedback we receive from others greatly impacts our behavior. Think about a recent large purchase you made — a TV, a car, a nice watch. Were you influenced by your friends or family at all? Chances are your answer is YES. We generally make many purchasing decisions (especially on large ticket items) based on the actions that others have taken in the past. Users want to consume content on their News Feed, but they are more likely to trust posts that have been validated by their network. In 2018, we launched a video ad campaign on Facebook after moving to California for YCombinator. See a difference between the ad on the left and the ad on the right? The ads are identical except for one small detail: the ad on the left shows that over 230,000 people who have viewed the video while the ad on the right shows only 1 view. Which ad do you think people watched more? You betcha: the ad on the left! The shares, likes, and comments on your ads demonstrate a positive response to the content you put out. This simple, yet effective display of feedback (social proof) builds trust with the people you are trying to reach and urges them to take action quickly. Therefore, the engagement on your ads is a huge asset to your business and one that (when applied properly) can get you better results than any other optimization. What happens when you have an advertisement or piece of content that has a lot of engagement, but you want to introduce it to a new audience? Often, Facebook advertisers will try to duplicate their highest performing ads. Before duplication, those ads have a lot of engagement. But the duplication process can cause the advertiser to lose all of those likes, comments, and shares. In this post, we’ll show you how to use re-use high performing ads over and over again (across different audiences) without losing all your built-up social proof. Follow these three easy steps to start seeing results. The first step is to find one of your best Facebook ads that is performing well with your audience. 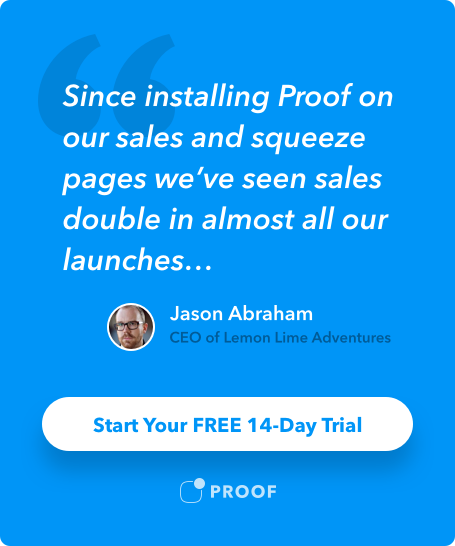 If you do not already have an ad with a good amount of social proof, you’ll want to experiment to find an ad that resonates with your target audience. A key indicator of success here will be engagement metrics: likes, comments, and shares. At Proof, we start out new campaigns by split testing multiple variations of ad creatives with low budgets to find out which resonates best with our target audiences. In the example below, we had a campaign with three ad sets. Each ad set had one ad copy variation targeting the same audience. The goal of this campaign was to find out which ad copy variation generated the most engagement from our target audience. As you can see above, we decided to choose the first ad set (“V3 Dave Page”) because after a few days it had the lowest cost per engagement. Once we had enough data to choose “V3 Dave Page” as the winning creative, we paused all of the other ad creative variations because they were outside of our key performance indicators. Once you have a high performing ad with engagement that you want to retain, the next step is identifying the permalink of the ad. To find the link, head into the Facebook Business Manager and open your winning ad. You’ll see that this loads up your ad with all of the shares, likes, and comments. In the screenshot below, our Post ID is 1829253269708977. Next, you want to copy these numbers and save them for use in the next step. After you’ve copied the Post ID for your winning ad creative, the next step is to create a new ad as you normally would. Choose an ad objective that makes the most sense for your campaign goal. Next, you go back into Business Manager and select a new audience at the Ad Set level just as you would when building a Facebook ad campaign. You will notice there are some quick ways to select page posts — do NOT select those items. Instead, enter the post ID in the field provided (as shown in the image below). You should now see your same ad carried over with all of the same likes, shares, and comments! And you’ll be able to test this creative with different audiences, placements, and locations. Facebook ad costs are rising and it’s becoming increasingly difficult to captive your target audience, but don’t worry! There are still some Facebook ad hacks you can use to stay ahead of your competition. The first place to look when improving your ad campaigns is to make sure you’re retaining your existing engagement. This seemingly minor tweak can really help you get the most bang for your buck by providing social proof. We’ll cover more Facebook ad hacks and Growth Marketing lessons in my upcoming posts. Have questions about implementing social proof on Facebook? Want more articles about Facebook ad hacks? Leave us a comment or give us a share!